Aldersgate is a related agency of the North Georgia Conference of the United Methodist Church serving persons with developmental disabilities. Established in 1991, we partner with United Methodist Churches and other individuals, groups and organizations to provide services to the developmentally disabled, their families, congregations, care givers and communities. Persons with developmental disabilities are underserved. Georgia ranks near the bottom of states in support for disabled citizens. Public funding for housing and services to the developmentally disabled is decreasing, placing these already vulnerable persons at greater risk. This is a stressful situation for those with disabilities and their families, who provide the vast majority of their care. As longevity increases and elderly parent caregivers “age out” of their role as major care providers, concerns for their adult children’s future needs arise. 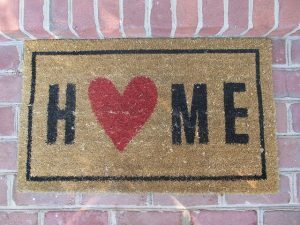 “Welcome Home” is a ministry to help individuals with developmental disabilities who want to live independently in the community. The program helps with deposits, furniture and other household goods that may be needed to live in the community. Aldersgate can help provide deposits, household goods, furnishings, and set-up for an individual who has a place to live but just needs assistance to being independent. Please take a look at the “Welcome Home” application form and the “Welcome Home” criteria for more information. Collinswood of Aldersgate is a universally accessible retreat and recreation center on Lake Oconee. Aldersgate received this property in the mid-1990’s. Starting from scratch and assisted by donations of money, time, and talents from within and outside of the United Methodist Church, Collinswood is today a very special place, a wonderful reality.At Collinswood, there are three cottages that will each sleep 20 persons. Each cottage has bedrooms, bathrooms, living areas and modified kitchen facilities designed for wheelchair access. Wilder Hall, the dining and meeting facility, provides a full kitchen with commercial equipment as well as ample seating for 60+ persons. All indoor facilities are heated and air conditioned for year around use.Near the cottages are a spacious covered open air pavilion with a fireplace, basketball, volleyball, and shuffleboard courts, and an open meadow area for other games and activities. The nature trail, a ramp, winds down through the woods just as any other nature trail does. The trail and a paved driveway lead to a lakefront picnic area with gazebo, bathhouses, a lakefront fire pit, and an accessible fishing dock. Collinswood is available for day and overnight retreat use. Please click here for registration forms and information on use of the facilities. We invite you to come and experience Collinswood. 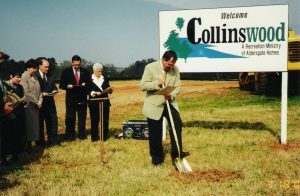 Collinswood continues to grow and expand. To help make continued growth a reality, click donation to make a donation to Collinswood. Your gifts will assist us as we increase our capacity and maintain this uniquely accessible facility.